During that May 26, 2010, meeting, Buffett deflected responsibility for Moody’s actions. “I knew nothing about the management of Moody’s,” he told the federal investigators, explaining candidly why he owned so much stock: Moody’s faced practically no market competition. “The single most important decision in evaluating a business is pricing power,” Buffett said. “If you’ve got the power to raise prices without losing business to a competitor, you’ve got a very good business.” The “big three” rating agencies—Moody’s, Standard & Poor’s, and Fitch—controlled 95 percent of the rating-agency market, an insurmountable advantage over would-be competitors. 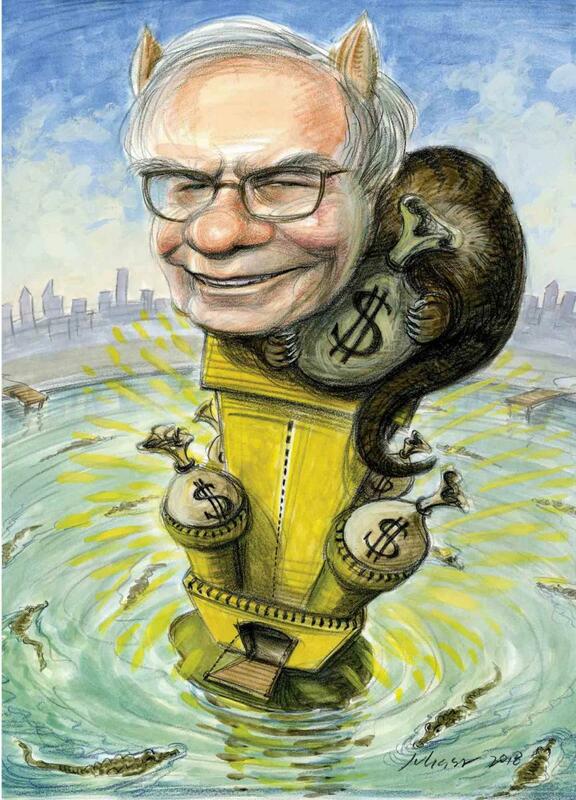 Warren Buffett is America’s favorite tycoon. The business community hangs on his every word. The annual meetings at Berkshire Hathaway, Buffett’s conglomerate, have been dubbed “Woodstock for capitalists.” Barack Obama and Hillary Clinton hailed his endorsements in their campaigns for president; even Bernie Sanders has supported Buffett’s position on taxes. The press treats him like a Kardashian, publishing quirky features about his bad eating habits, frugal spending, and hobnobbing with celebrities (an actual headline last November: “Katy Perry Wants to Know What Warren Buffett Thinks of Bitcoin”). An old cartoon show called Warren Buffett’s Secret Millionaires Club featured the so-called “Oracle of Omaha” teaching children how to get rich. This Nation investigation documents how Buffett’s massive wealth has actually been built: on monopoly power and the unfair advantages it provides. Companies in Buffett’s portfolio have extorted windfall profits, evaded US taxes, and abused customers. In the two specific cases discussed below, in the banking and high-tech industries, Buffett’s investments have prompted federal investigations for anticompetitive or other illegal practices. Buffett did not respond to repeated interview requests for this article, nor did he reply to questions submitted to his office at Berkshire Hathaway. America isn’t supposed to allow moats, much less reward them. Our economic system, we claim, is founded on free and fair competition. We have laws over a century old designed to break up concentrated industries, encouraging innovation and risk-taking. In other words, Buffett’s investment strategy should not legally be available, to him or anyone else. Over the past 40 years, however, the United States has not only failed to build bridges across monopoly moats; it has stocked those moats with alligators. Two-thirds of all US industries were more concentrated in 2012 than in 1997, The Economist has documented. Since the Reagan era, the federal government has abandoned antitrust enforcement, with markets for products like eyeglasses, toothpaste, beef, and beer whittled down to a few suppliers. This consolidation has vastly inflated corporate profits, damaged workers and consumers, stunted economic growth, and supercharged economic inequality. Buffett professes to be an innocent witness to this perversity, a passive investor observing markets from afar. He is feted as the conscience of American capitalism, a multibillionaire who speaks out about taxing the rich (Democrats even named their tax-fairness plan the “Buffett rule”) and donates his fortune to charity. But Buffett’s example has helped intensify US monopolization, as other investors mimic his approach of finding companies surrounded by moats. The ownership class has subsequently built up unwarrantedly large holdings, concentrating its investment in companies that further increase market power. In other words, Buffett isn’t following America on the road to oligarchy; he’s leading it. Americans falsely look to these oligarchs to solve our problems, allowing them to amass more power. For example, the recent joint effort by Buffett’s Berkshire Hathaway, Amazon, and JPMorgan Chase to transform the US health-care system is vague and rather mundane—most large companies try to drive down health-care costs by leveraging their size. But when three of the age’s biggest monopolists follow the trend, it’s uncritically treated as front-page news, sending health-care stocks plummeting. A stray press release from Buffett can move billions of dollars in his favor. Bill Gates of Microsoft, Jeff Bezos of Amazon, and Warren Buffett control more wealth than the 160 million poorest Americans combined. And Buffett doesn’t mind working the system to keep it that way. His net worth as of January is $87 billion, but Buffett says he paid only $1.8 million in taxes in 2015—a mere 0.002 percent of his wealth. According to Barclays, the new Republican tax law is projected to net his business a staggering $37 billion a year. Free markets are for chumps— Warren Buffett insists on monopoly moats. Warren Buffett should not be celebrated as an avatar of American capitalism; he should be decried as a prime example of its failure, a false prophet leading the nation toward more monopoly and inequality. You probably didn’t realize that the same avuncular billionaire controls such diverse companies and products as See’s Candies, Duracell batteries, Justin Boots, Benjamin Moore Paints, and World Book encyclopedias. But Buffett has transformed Berkshire Hathaway, initially a relatively small textile manufacturer, into the world’s largest non-technology company by market value. Berkshire Hathaway owns over 60 different brands outright. And through Berkshire, Buffett also invests in scores of public corporations. The conglomerate closed 2016 with over $620 billion in assets. The dominant narrative around Buffett is that he invests in big, blue-chip companies whose products he enjoys, like Coca-Cola or Heinz ketchup. But Buffett’s taste for junk food cannot match his hunger for monopoly, and he scours the investment landscape to satisfy it. For example, he’s a major investor in the most profitable company you’ve never heard of—one used by hundreds of millions of people worldwide, mostly without their knowledge. The company is called Verisign, and it operates an essential backbone of the Internet: registries for the domain names .com and .net, among others. If you want to create, for example, MyWebsite.com, you buy the name from a retailer like GoDaddy. But Verisign controls the global registry for .com, so GoDaddy relies on Verisign to connect users to MyWebsite.com. Verisign collects a small fee for this service, usually less than $10 a year. But drawing that fee from an enormous pool of websites results in a massive revenue stream. The nonprofit Internet Corporation for Assigned Names and Numbers (ICANN), the registry industry’s main regulator, granted Verisign exclusive contracts to operate .com and .net. Verisign can automatically renew the contracts as long as it meets certain performance metrics. The company was also initially permitted to raise prices gradually, despite the fact that the costs of managing a registry decline over time because the necessary infrastructure is already established. “If you’re giving a near monopoly in an industry where prices are falling, you would think that you would have terms in the contract to lower the price,” said economist Dean Baker, a critic of government-granted monopolies. Instead, prices for .net domain names can rise 10 percent per year; they’ve more than doubled since 2005, from $3.50 to $9.02 (Verisign’s statement called this price “lower than most competing legacy [top-level domains]”). Prices for .com domain names have also risen, though they are now frozen at $7.85 per year, due to an amended contract executed in 2012. Competitors have offered to run registries at significantly cheaper rates, yet ICANN hasn’t altered Verisign’s contract terms. Normally, companies with regulated prices aren’t profit-making juggernauts. But in the third quarter of 2017, Verisign’s operating income as a percentage of revenue hit 61.9 percent, putting it near the top of all companies in the S&P 500. This number has climbed steadily since 2006. If the trend continues, sometime in the next decade Verisign will post the highest rate of profitability of any public company on earth. That may explain why Buffett owns nearly 13 million shares of Verisign stock, worth $1.47 billion as of mid-January 2018. Buffett is famously averse to Internet stocks, but he does like a sure thing. So does the rest of the market: Verisign stock jumped nearly 44 percent in 2017. Buffett’s seal of approval tends to boost fortunes on Wall Street, so more money flows into monopolies. The Justice Department opened a yearlong investigation into the potential rigging of the .web auction, but in January, the department closed the case. In a research note, JPMorgan Chase called Verisign’s acquisition of the domain name “a very good defensive strategic move, keeping .web out of the hands of the potential competitor.” Verisign’s monopolies remain well guarded—and a continuing source of profits for Warren Buffett. What changed between 2007 and 2016? With the blessing of federal regulators, the airline industry became an oligopoly. Four mega-mergers—combining Delta and Northwest, United and Continental, Southwest and AirTran, and American and US Airways—solidified major-carrier dominance in the United States. Today, four airlines control 80 percent of domestic-seat capacity. In 93 of the top 100 airports, either one or two manage a majority of all seats sold. Market concentration has resulted in higher profits for the airlines and for Buffett, but misery for the passengers: crowded planes, more connections, and a cascade of nickel-and-dime fees. Perversely, by making flying worse, airlines further loosen passengers’ wallets, enticing those who can afford it to buy more legroom, or priority boarding to ensure that their bag gets in the overhead bin. Ancillary fees represented a little over 10 percent of the airlines’ total revenue in 1995; today, it’s more than 25 percent. The public wouldn’t stand for such fleecing if they had a choice, but market consolidation forces customer acceptance. David Dao learned the harsh realities of monopoly air travel last April, after refusing to relinquish his seat to solve an overbooking problem on a United flight. Security agents violently dragged Dao, a 69-year-old physician, down the aisle and out of the aircraft, breaking his nose and knocking out two teeth. The incident gave United a public-relations black eye—video of Dao’s ordeal was viewed over 9 million times, and United’s CEO was hauled before Congress—but it didn’t damage the company’s bottom line. The Department of Transportation declined to prosecute, United’s stock price recovered after an initial dip, and seats remained filled to near capacity. Buffett has similarly defended Wells Fargo, his largest single investment, through one damaging scandal after another. In 2016, the bank was caught signing up customers for around 3.5 million fake accounts. Since then, Wells Fargo has also been dinged for issuing clients unwanted insurance and home-warranty products, falsifying records to increase fees on mortgage applicants, overcharging foreign-exchange clients to ring up bonuses, initiating secret changes to mortgage terms for homeowners in bankruptcy, and repossessing the cars of service members while they were on active duty. The federal investigations and fines over this misconduct continue to roll in. Millions have been harmed by this mix of rank incompetence and outright fraud. But with the five biggest commercial banks—Wells Fargo, Bank of America, Citigroup, JPMorgan Chase, and US Bancorp—controlling nearly half of all assets, as well as robust branch and ATM networks, it can be inconvenient or even impossible not to use their services. Last August, Buffett called Wells Fargo “a terrific bank…. There were some things that were done very wrong there, but they are being corrected.” In October, he got tougher, blaming Wells Fargo’s board of directors for failing to “remove the stain” on the business and musing about clawing back five years of compensation. But Buffett had supported the same board members for reelection just months earlier. It resembled his decision in 2014 to criticize the board of Coca-Cola for excessive executive compensation, but to abstain from voting on the pay package. At the time, Buffett’s son Howard sat on Coke’s board. In other words, while Buffett’s wealth and the media attention he attracts enable him to create change inside the boardroom, he takes virtually no responsibility as a major shareholder for the companies he invests in. “He’s following his wallet, not his conscience,” says David Nelson, chief strategist at Belpointe Asset Management. Windfall profits, taxpayer rip-offs, customer abuse—it’s all in a day’s work for the Oracle of Omaha. As of last September, Buffett’s financial-industry holdings approximate an astonishing $66.9 billion—more than 37 percent of his portfolio. He is Wells Fargo’s largest shareholder, and he recently became the largest shareholder in Bank of America as well, the result of a post-financial-crisis deal allowing Buffett to convert an injection of capital into common stock. That conversion earned him $12 billion overnight. A similar crisis-era investment in Goldman Sachs spawned a $3 billion payday. Buffett also holds major stakes in Bank of New York Mellon, US Bancorp, and M&T Bank. He has a hand in every major credit-card issuer: American Express, Visa, MasterCard, and Synchrony Financial, which provides private-label credit cards to retailers. While Buffett doesn’t own stock in JPMorgan Chase, his top deputy Todd Combs sits on the board, obviously aware of the activities of the leading competitor to his boss’s banking investments. You may think you have a choice of financial institutions, but when you pull out a piece of plastic to pay for anything, chances are you’re enriching Warren Buffett. It would be one thing if Buffett were passive about investments he doesn’t totally control but scrupulous regarding the businesses owned within Berkshire Hathaway’s portfolio. But only 25 people work at Berkshire’s headquarters, overseeing 63 companies and more than half a trillion dollars in assets. It’s impossible for Buffett to be anything but an absentee owner, instructing portfolio managers to gain market share but ignorant of how they do it. And anyone who has watched Buffett operate over the past 40 years knows his preferred path to wealth: through monopoly. Among his first investments were newspapers, including the 1977 purchase of the Buffalo Evening News. Buffett immediately targeted the News’s rival, the Courier-Express, by launching a Sunday edition. By 1982, the Courier-Express was out of business, and Buffett’s local monopoly became his largest single investment. Even today, despite the Internet, Buffett owns 31 daily newspapers, most of them local monopolies. A more brutal example involves Berkshire Hathaway subsidiaries Clayton Homes, the nation’s largest mobile-home builder, and Vanderbilt Mortgage, its companion lender. A series of journalistic investigations in 2015 found that the companies targeted minorities with high-pressure sales tactics, issuing loans swollen with hidden fees. African-American, Native American, and Latino borrowers received higher interest rates, even if their fellow white borrowers earned less. When the loans failed, Clayton repossessed and resold the homes, earning more fees each time. The Consumer Financial Protection Bureau’s complaint databases are littered with hundreds of comments about Clayton and Vanderbilt. “This type of behavior by any lender is despicable and absolutely intolerable,” wrote one complainant. Buffett has publicly defended the businesses, which earned $744 million in 2016. He even tried to attack the credibility of a critical reporter, because the reporter’s sister worked at a law firm that sued Clayton. In 2017, Buffett vowed that Clayton Homes would grow, despite admitting that it foreclosed on one out of every 40 properties the previous year—over three times the national average. The disparity between Buffett’s words and actions is an enduring feature. His main entry into the political arena involves a plea for tax fairness, to “stop coddling the super-rich.” But Buffett’s third most valuable stock holding (after Wells Fargo and Kraft Heinz) is a $22.8 billion investment in Apple, perhaps America’s most notorious corporate-tax evader, famous for stashing profits in offshore tax havens. Buffett takes full advantage of tax loopholes. He uses Berkshire Hathaway, a valuable tax shelter, for his investments. The Republican tax bill will save Berkshire an estimated $37 billion, because the firm habitually defers its tax liabilities, which will now be paid off at a much lower rate. Even the infamous ”private-jet tax break” in the bill is really an extrajudicial attempt to settle a dispute between the IRS and NetJets, a private-plane company wholly owned by Berkshire Hathaway. Former Supreme Court Justice Louis Brandeis called businesses like Buffett’s, which use other people’s money to create personal fortunes, the “Money Trust.” These financier middlemen “bestride as masters of America’s business world, so that practically no large enterprise can be undertaken successfully without their participation or approval,” Brandeis wrote. Buffett routinely takes advantage of opportunities unavailable to ordinary investors: The mega-bank Goldman Sachs created an internal “brain trust” solely to pitch deals to people like Buffett. “The kind of trades he does today no one else can do—you gotta be that big,” explains David Nelson of Belpointe Asset Management. Amazingly, Buffett has spearheaded an effort to promote “commonsense corporate governance principles,” joining the CEOs of America’s largest corporations, from General Motors to JPMorgan Chase. The group’s manifesto states that “[o]ur financial markets have become too obsessed with quarterly earnings forecasts,” recommending that institutional investors make informed decisions about the direction of the companies they hold. But this is precisely what Buffett never does; he openly ignores management performance in favor of finding businesses with moats. This has become his perfect excuse: Buffett evades responsibility for abuses of market power, preserving his pristine reputation by passing the buck. Nor does Buffett acknowledge his role in driving further monopolization. The investment-research firm Morningstar has created the “economic moat” index to track the 20 companies with the highest walls around their businesses. The money-management firm VanEck sells an exchange-traded fund based on that index called “MOAT.” Companies like Valeant Pharmaceuticals scoop up lifesaving drugs that nobody else makes and jack up the prices; it’s the moat strategy taken to its logical extreme. “We’re seeing this almost spontaneous decision across whole industries that they’re going to milk existing market positions rather than compete aggressively,” Harding says. Buffett says he supports fairer taxes, but owns $22 billion of tax evader Apple. What’s the answer? First off, aggressive antitrust enforcement. “What the framers of the antitrust laws…were concerned about is unreasonable market power that gives companies the chance to engage in predatory behavior of consumers and political power,” Reich says. Companies like Verisign, which exploit their monopolies, should face greater scrutiny. Dominant players in industries like airlines and banks should be downsized. Sprawling investors like Buffett also present concerns. “If we didn’t allow Buffett to own substantial stakes in all air carriers, the problem would be significantly reduced,” says the University of Michigan’s Martin Schmalz. We must also consider disproportionate capital concentration. The top 1 percent owns a significant portion of all wealth, and it increasingly makes money just from having money. Globally, 82 percent of the wealth generated in 2017 flowed to that top 1 percent, according to Oxfam. Through dividends, interest payments, and rising investments—Buffett-style passive ownership—the holders of capital capture about 30 percent of national income, according to research by Thomas Piketty, Emmanuel Saez, and Gabriel Zucman. “If you’re well diversified and you just chill out, you will make a lot of money without doing much for it,” says Matt Bruenig, founder of the People’s Policy Project. Bruenig has proposed a wealth tax, with the revenue directed into a stock-accumulating sovereign-wealth fund. Citizens could receive a direct dividend from the gains, the way Alaskans receive a check from the state’s Permanent Fund. Instead of someone like Buffett hoarding wealth to extract income, we would all benefit in service to a fairer society. And as with Norway’s wealth fund, the government could involve itself more directly in corporate governance, as a countervailing force to shareholder tyranny.